Like any good process, the SHSP starts with several fundamentals, such as good leadership, collaboration, and effective communication. These fundamentals provide the foundation for the update process, but also ensure that you create a plan that can be successfully implemented and evaluated. These fundamentals are highlighted in the SHSP Implementation Process Model (IPM) and are summarized in the steps below. Many of these elements already may be in place for your SHSP and functioning well. In other cases you may have to make changes if the process is not as effective as it could be. The bottom line is an SHSP can only work if it has the proper support and is brought to life through action. The steps below will help to get you there. Champions—Champions provide enthusiasm and support for the SHSP and must be credible and accountable, have excellent interpersonal and organizational skills, and be a skilled expediter. Safety champions help secure the necessary leadership, resources, visibility, support, and commitment of all partners. Some examples include the Secretary or Director of the DOT, the head of the State Highway Safety Office, a legislator, or the Superintendent of the State Police or Highway Patrol. Leadership Committee(s)—Some States have both an Executive Committee and a Steering Committee that lead the SHSP. An Executive committee provides leadership for SHSP development, implementation, and evaluation. Steering Committees guides the SHSP process, and regularly reviews progress and receives updates on SHSP-related programs and projects. The Appendix includes a list of suggested members for both committees along with suggested roles and responsibilities. To encourage leaders to participate in the SHSP, the 4 Es has developed an SHSP Leadership Flyer which details reasons why these officials should get involved. The Pennsylvania SHSP is developed under the guidance and direction of a Multi-Agency Safety Team (MAST), which includes leadership from various State agencies. These agencies signed a memorandum of understanding agreeing to support Pennsylvania’s vision, mission and goal and implement the highway safety strategies for which they are responsible. In addition, the MAST supports the SHSP in a numerous ways, including: approving the SHSP prior to submission to FHWA; oversight of task action teams; preparing summary of achievements and successes for the Governor’s Office; and evaluating the plan, initiating redirection of priorities, and requesting revisions to the plan. Effective Organizational Structures—The organization of the SHSP follows a fairly simple approach with the Executive Committee leading the effort, followed by the Steering Committee, and Emphasis Area teams. Some States also have a Data Team or Working Group that functions as a support for the overall plan. Other major Federal, State, Tribal, and local safety stakeholders. Collaboration and Communication with Your Stakeholders—Collaboration and communication is essential to getting and keeping a diverse group of stakeholders active and involved in the SHSP process. Collaborative problem solving means bringing people together to jointly develop solutions to difficult problems such as reducing traffic-related deaths and serious injuries. The FHWA SHSP Stakeholder Involvement Flyer provides information on the benefits of collaboration. The SHSP document itself should clearly and concisely describe the State’s safety problem and describe a program of priorities and strategies to reduce fatalities and serious injuries on all roadways in the State. Format also is important and should be discussed among the safety partners and the final format should be broadly supported among them. The SHSP Preparation section of the Champion’s Guide to Saving Lives provides some useful recommendations. 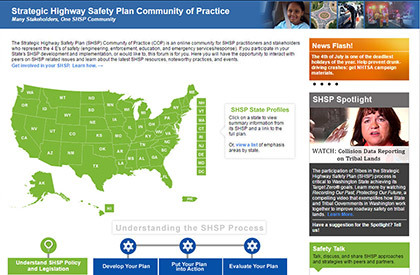 In Arizona, the SHSP update process included an extensive statewide safety stakeholder outreach effort. Two major safety events and task force work sessions were conducted. The first major event was the Safety Launch, designed to bring together Federal, State, regional, local and Tribal transportation safety stakeholders from across Arizona. This was followed by a Safety Summit, in which stakeholders participated in three rounds of individual task force work sessions between and after the two major safety events. Each task force included industry and subject-matter experts and other transportation-safety advocates. These task forces worked to establish the SHSP Emphasis Areas and develop proposed strategies and action steps to improve safety. The Arizona SHSP has more information on the effort. SHSP Implementation Process Model—The Implementation Process Model (IPM) provides the essential eight elements and steps that will help States successfully implement their plan. FHWA Office of Safety—The Office of Safety works to reduce the number of crashes on U.S. roadways and the severity of crash impacts. Strategic Highway Safety Plan (SHSP) Development Course—This course provides details on the steps States should take to develop their SHSPs. Highway Safety Improvement Program (HSIP) Overview Course—This course is intended to provide a basic understanding of the purpose of the (HSIP) and relationship of HSIP programs, background on data collection and quality measures, and an overview of the HSIP processes for planning, implementation, and evaluation. Strategic Highway Safety Plan Implementation Course—The Strategic Highway Safety Plan (SHSP) Implementation Course provides strategies and examples of SHSP implementation processes. It draws from the SHSP Implementation Process Model (IPM) and other sources to assist safety practitioners in managing SHSP implementation. Other data such as demographics from the Census Bureau, data from insurance companies, etc. Crash data is generated from reports from law enforcement officers and may be managed by the State law enforcement agency, State Highway Safety Office, or the Department of Transportation. Roadway data is maintained by the DOT; driver and vehicle records by Department of Motor Vehicles; injury surveillance by the Department of Health; and citation, prosecution, and adjudication data by the courts. Directing limited resources to the highest potential for reducing fatalities and serious injuries. Ohio uses data to inform their SHSP emphasis areas and to educate SHSP stakeholders, public officials, and others about the SHSP. Emphasis Area Fact Sheets provide some general background information along with specific information on who is involved in the crashes, where and when the crashes occurred, and any contributing factors such as speeding, vehicle and crash type, etc. To view copies of these safety fact sheets, visit the Ohio SHSP Web page (go to Emphasis Area Pages, and click on the Safety Fact Sheet you want to view). Fatality Analysis Reporting System (FARS)—FARS is a Nationwide census which provides data on fatal injuries suffered in motor vehicle traffic crashes. Traffic Records Coordinating Committee—The DOT Traffic Records Coordinating Committee (DOT|TRCC) is a multimodal group with members from FHWA, FMCSAM, NHTSA, and RITA that works to improve the collection, management, and analysis of traffic safety data at the State and Federal level. Similar committees exist in each State and are usually managed by the Highway Safety Office. Applying Safety Data and Analysis to Performance-Based Transportation Planning—This guidebook provides State and regional planners with information on how to effectively use safety data and analysis tools in performance-based transportation planning and programming processes. Crash Data Improvement Program (CDIP)—The CDIP is intended to provide States with a means to measure the quality of the information within their crash database. It is can provide States with metrics to measure where their crash data stands in terms of its timeliness, the accuracy and completeness of the data, the consistency of all reporting agencies reporting the information in the same way, the ability to integrate crash data with other safety databases and how the State makes the crash data accessible to users. Roadway Data Improvement Program (RDIP)—The Roadway Safety Data Program works to improve safety data and expand capabilities for analysis and evaluation by providing tools and resources. A toolbox is available to help agencies find the appropriate tool based on their specific needs and capabilities. NHTSA Traffic Records Assessment—NHTSA’s assessments are peer evaluations of State traffic records system capabilities. Using the online State Traffic Records Assessment Program (STRAP), independent subject matter experts from State, local, and other areas examine State responses to a uniform set of questions and rate the responses against the ideal set out in the Traffic Records Program Assessment Advisory. FMCSA Analysis and Information Online (A&I)—A&I is FMCSA’s online resource center for analytical data, statistics, recent studies, and reports on truck and bus safety. National EMS Information (NEMSIS) Web Site—NEMSIS is the national EMS database that includes data and information collected throughout the EMS system. Information is available on tools that are used, reports, etc. Each SHSP identifies the areas where they want to focus. These emphasis areas should be selected based on an analysis of available data and input from safety stakeholders representing the the 4 Es of safety. Emphasis areas may change during SHSP updates based on the results of ongoing safety data analysis. Many States have found a fewer number of emphasis areas (usually between four and eight) helps direct efforts and makes the SHSP a more “strategic” and effective plan. Source: Arizona 2014 Strategic Highway Safety Plan. To select emphasis areas, some States start with a list of emphasis areas identified in the Towards Zero Deaths: A National Strategy for Highway Safety or the American Association of State Transportation Officials Strategic Highway Safety Plan and then look at the number of traffic-related fatalities and serious injuries and select those areas with the greatest number as shown in the figure. Areas that are showing increases above and beyond any increases in overall fatalities and serious injuries. Use five-year rolling averages to even out the ups and downs in the numbers. Show stakeholders several options for the amount of reduction, for instance the percentage reduction if the goal is the AASHTO goal to halve fatalities by half by 2030, or the percentage reduction being used by the Highway Safety Office in their HSP. What works best for your SHSP? Most States include in their SHSP measurable objectives for the statewide fatalities and serious injuries. We use the term objectives because that indicates the specific, measurable progress the State wants to achieve. Goals are broad, general statements that relate to the overall mission. SHSP measurable objectives are not the same thing as the annual safety targets required for the HSIP and the HSP since the SHSP is a five-year plan. States, however, can use the SHSP process as a starting point for aligning the method used for establishing all objectives and targets. Since annual targets are updated more frequently than the multiyear SHSP objectives—and should take into account the impact of planned programs and projects—annual HSP and HSIP targets may deviate from the multiyear SHSP objectives. Once the method is agreed upon (by the State Department of Transportation, State Highway Safety Office, and other SHSP stakeholders involved in developing annual targets, e.g., Metropolitan Planning Organizations), States can develop the fatality and serious injury objectives for the multiyear period of the SHSP. States can calculate what percentage of the overall fatality and serious injury each emphasis area represents and calculate the reductions accordingly. Safety Target Setting Final Report—This document reviews the role of transportation safety target setting in a performance management framework, summarizes the state of the practice in safety target setting, and presents a framework for developing or updating transportation safety targets. A Compendium of State and Regional Safety Target Setting Practices—This report documents State and regional safety targets, methods, data used, and target consistency. It contains a fact sheet on each State’s and region’s target setting practices. Safety Target Setting Peer Exchange—This report documents a peer exchange held in February 2013 with 10 transportation agencies to discuss safety target setting methods. Target Setting Literature Review—This document is a literature review of the role of target setting in a performance management framework and provides examples of national safety target setting. Urbanized and Nonurbanized Safety Target Setting: Final Report—This report reviews the role of transportation safety target setting in a performance management framework, summarizing the state of the practice in safety target setting and presents a framework for developing urbanized and nonurbanized safety targets. A Primer on Safety Performance Measures for the Transportation Planning Process—This Primer is a tool to help State and local practitioners, transportation planners, and decision makers identify, select, and use safety performance measures as a part of the transportation planning process. Strategies detail how the State will achieve each objective. If the objective is to reduce lane departures by 10 percent over the next five years, then what will the State need to do to achieve that reduction? One strategy could be to identify the most hazardous lane-departure locations in the State and reduce lane-departure crashes at those locations while another strategy could be to install rumble strips on principal arterials. The actions then detail what steps need to be taken to implement that strategy, i.e., obtain base line data, conduct road safety audits, conduct high-visibility enforcement campaigns, etc. Each action should include an action plan that provides more detail such as what agency or organization will take the lead on ensuring the action is implemented, what resources are needed (staff, equipment), what is the timeline and budget, and what is the scope (statewide or a local/regional pilot). Action plans turn SHSP concepts and ideas into a reality that saves lives and prevents injuries. For more information, go to the Develop Emphasis Area Action Plans section of the SHSP Implementation Process Model. Vermont has developed an SHSP Supplement, which acts as the work plan for the SHSP and outlines the framework that the Vermont Highway Safety Alliance (VHSA) and its safety partners will utilize to advance Vermont’s safety initiatives. The Supplement includes action plans with a description of the actions for each individual strategy, along with the action plan champion, potential partners to assist in the implementation of the plan, and the targeted goal. The VHSA, its Focus Groups, and other safety partners have worked diligently to create aggressive but achievable action plans to forward Vermont’s agenda on road safety and reduce major crashes. The action plans are developed in a collaborative process and reach across all disciplines of roadway safety (Education, Enforcement, Engineering, and Emergency Services). FHWA Office of Safety Proven Safety Countermeasures—The FHWA Office of Safety compiled this list of nine proven countermeasures to address crashes that occur in the focus areas of intersections, pedestrians, and roadway departure. NHTSA Countermeasures That Work—This publication is a basic reference to assist State Highway Safety Offices (SHSO) in selecting effective, evidence-based countermeasures for nine traffic safety problem areas: Alcohol- and Drug-Impaired Driving; Seat Belts and Child Restraints; Speeding and Speed Management; Distracted and Drowsy Driving; Motorcycle Safety; Young Drivers; Older Drivers; Pedestrians; and Bicycles. Motor Vehicle Prioritizing Interventions and Cost Calculator for States (MV PICCS)—CDC offers a new interactive calculator, called the Motor Vehicle PICCS (Prioritizing Interventions and Cost Calculator for States), pronounced “picks.” This tool will help State decision makers prioritize and select from a suite of 12 effective motor vehicle injury prevention interventions. MV PICCS is designed to calculate the expected number of injuries prevented and lives saved at the State level and the costs of implementation, while taking into account available resources. NCHRP 500 Series: Guidance for Implementation of the AASHTO Strategic Highway Safety Plan Transportation Research—The National Cooperative Highway Research Program (NCHRP) has developed a series of guides to assist State and local agencies in reducing injuries and fatalities in targeted areas. The guides correspond to the emphasis areas outlined in the AASHTO Strategic Highway Safety Plan. Each guide includes a brief introduction, a general description of the problem, the strategies/countermeasures to address the problem, and a model implementation process. NCHRP 622: Effectiveness of Behavioral Highway Safety Countermeasures—The purpose of this report is to develop a roadmap for States, and a best practices guide for the use and assessment of behavioral countermeasures. All countermeasures that are used or could be used are considered and the cost and/or effectiveness is indicated when available. Toward Zero Deaths (TZD): A National Strategy on Highway Safety—Toward Zero Deaths is the United States’ highway safety vision and is presented as the only acceptable target for the Nation, families, and individuals. The Web site includes information on the TZD Communication Plan, how to become a participant, and a video on how everyone’s efforts are helping. FHWA Crash Modification Factors Clearinghouse—The Crash Modification Factor (CMF) Clearinghouse offers transportation professionals a central, Web-based repository of CMFs, as well as additional information and resources related to CMFs. Effective SHSP implementation leverages the resources of other transportation planning and programming activities. The SHSP can be integrated into existing transportation and safety planning processes, such as HSIP, HSP, Long-Range Transportation Plans (LRTP), Commercial Vehicle Safety Plans (CVSP), and Statewide Transportation Improvement Programs (S/TIP). This integration is important for improving overall safety coordination and linkages among the State, regional, local, and Tribal agencies and lead to a more comprehensive approach to transportation safety planning. It also ensures all agencies understand the key safety priorities. Delaware integrates its SHSP with other State plans and programs by forming a committee of coordinating agencies; aligning goals and strategies; identification of roles and responsibilities for leading 4 Es strategies; and strengthened partnerships. More information on Delaware’s process is available. Find your State’s Highway Safety Plan (HSP)—The HSP is the document that is developed annually by the State Highway Safety Office and details what programs and activities the State will be conducting in the coming fiscal year. A companion Year End Report provides information on how well the State met the goals and objectives in the HSP. Access your State’s HSIP Annual Report, which describes the progress being made to implement highway safety improvement projects; assesses the effectiveness of those improvements; and describes the extent to which the improvements have contributed to reducing fatalities and serious injuries on all public roads. Learn more about the Motor Carrier Safety Assistance Program (MCSAP) and State Commercial Vehicle Plans (CVSP). MCSAP is designed to help commercial vehicle carriers and drivers improve their safety performance, and CVSPs outline what strategies and actions will be taken to reach that goal. Marketing is the process for creating, communicating, delivering, and exchanging information about your SHSP to the public, to safety stakeholders, and to elected officials. Marketing benefits SHSP implementation efforts in several ways: it increases awareness of the SHSP goal to reduce traffic-related fatalities and serious injuries; educates key political leaders on their role in saving lives; and helps address those SHSP elements that require behavior change. Marketing the SHSP can involve the creation of a separate SHSP Web site, an SHSP Web page on the State’s DOT Web site, a link to a TZD type of Web site, a Facebook page, newsletters, electronic bulletins, tweets, etc. Learn more about marketing your SHSP. Louisiana uses a variety of methods to market their SHSP. The have a Destination Zero Deaths (DZD) Web site which features the SHSP and all plan related activities, a Destination Zero Deaths Facebook page, a Twitter account, and they publish a quarterly newsletter that is delivered to all SHSP stakeholders. The State also has formed a Communications Coordinating Council that involves representatives from the SHSP Steering Committee, the nine regional safety coalitions, and experts at marketing and public relations from various State and local agencies. The group meets quarterly and has developed a Communications Plan to help market the SHSP and assist in implementing SHSP strategies and actions that focus on marketing. For more information, visit the DZD Web site. Are we doing things right, i.e., did we do what we said we were going to do? Are we doing the right things, i.e., are we making a difference? In addition, regularly recurring evaluation is a requirement of the SHSP to ensure the accuracy of data and proposed strategies. This is because safety improvements depend on a program of data-driven priorities and proven effective strategies. Evaluation helps States achieve such a program by analyzing SHSP process and performance and determining whether current activities deserve enhancement, revision, or replacement. The Nevada SHSP compiles their SHSP evaluation results into an Annual Report, which shows progress for their performance measures and supporting data. More information on Nevada’ process is available. Evaluation is intended to take the place of trial and error, guesswork based on anecdotal evidence, and intuition. Evaluation helps States assess the progress of their SHSP and identify opportunities for improvement. The results can help strengthen the SHSP process and performance and in so doing improve the State’s transportation safety. Elements of SHSP evaluation already are in place in many States; however, additional benefits can be realized by organizing and institutionalizing these elements into a comprehensive program evaluation, as outlined in the SHSP Evaluation Process Model (EPM). Program evaluation looks at the overall SHSP. It can identify where SHSP and emphasis area goals are met or unmet and point toward likely strengths or shortcomings, i.e., the failure to implement certain strategies or the identification of strategies not having the expected effect. The EPM can help States address the evaluation requirement as well. Learn more about conducting an SHSP evaluation in the SHSP EPM. Safety Talk is an online SHSP discussion forum dedicated to sharing strategies and approaches for updating, implementing, and evaluating SHSPs. Safety Talk membership is by invitation. If you’re not already registered, contact Jennifer Warren and ask to be a member! SHSP Evaluation Process Model (EPM)—The EPM assists States with conducting a program evaluation of their SHSP. Program evaluation looks at the overall SHSP process, helping States assess how they develop, manage, and implement their SHSP. It also examines the SHSP’s performance and identifies if goals and objectives are being met. The EPM will help States answer basic questions of program evaluation, such as: What are we trying to do? How well are we doing it? How can we improve? Traffic Safety Performance Measures for States and Federal Agencies—This publication contains a minimum set of performance measures to be used by State and Federal agencies in the development and implementation of behavioral highway safety plans and programs. The Art of Appropriate Evaluation—This guide describes the benefits of evaluation of provides an overview of the steps involved. You have been given a lot of information, resources, and links to more information. If you visit the SHSP Community of Practice, you will find it all there too! You also can visit FHWA’s SHSP Web page. Make sure to bookmark these sites. The SHSP Community of Practice (COP) is an online community for SHSP practitioners and stakeholders who represent the 4 Es of safety (engineering, enforcement, education, and emergency services/response). Here you will have the opportunity to learn about the latest SHSP resources, noteworthy practices, and events as well as interact with peers on SHSP-related issues through the Safety Talk discussion Forum. You may need Adobe® Reader® to view the PDFs on this page.